The principle of operation of an infrared heater is based on the transmission of electromagnetic radiation from a source to surrounding objects. Once on the surface, which is able to absorb infrared radiation, turning it into thermal energy, such a device heats the air in the room through convection processes of heat exchange from heated objects. Considering the specifics of the radiation, only 10% of the energy of the infrared heaters is spent on raising the air temperature, everything else goes on heating the objects in front of the device. For those who deeper want to understand the technical characteristics of infrared heaters, we have prepared this material. Infrared heaters have not only several versions (we will discuss this later, but also several principles of operation, each of which is based on IR radiation. 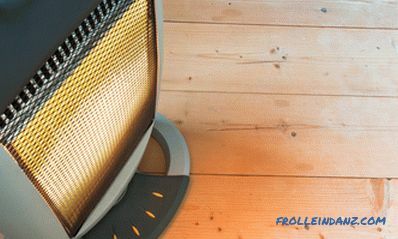 Consider the technical characteristics of each of these infrared heaters. This type of device produces heating by the classical method - thermal convection. This happens with the help of secondary thermal radiation, which it produces, heating IR waves to one of its structural elements - the front panel. It is not very effective, but it eliminates the problem of too close sources of open infrared radiation and their effect on the human body. The device produces heating with directed IR radiation. Reflector - reflector, made of metal, most often aluminum. Its surface is carefully polished. Designed for the formation and intensification of the flow of infrared radiation and the localization of the heating zone. In addition to the listed components, there are a few more nodes that are included in most standard heaters. This is a thermostat that can be both electronic and mechanical. The device is designed to control the set temperature. Manufacturers can set up a temperature-sensitive sensor to take readings from various objects; they can be the radiation source itself, its body or an external object. 5. The base of the heater. A specific feature of these IR heaters is that they are completely autonomous. During the combustion of gas, a radiating element is heated, over which there is a reflector. IR waves are reflected from the reflector and sent to the space where the reflector is directed. This type of infrared heater burns oxygen. According to the principle of placement indoors or outside (installation method), infrared heaters are divided into floor, wall and ceiling. Floor-standing - they are usually portable, most models have a purely functional design, equipped with a handle for carrying and a special compartment for the cord. Such devices are used exclusively as auxiliary heat sources. IMPORTANT! When choosing a portable model, you need to pay attention to whether the compartment where the cord is retracting overheats. Protective wiring may melt. High power models with significant weight are additionally equipped with wheels to facilitate transportation. In the standard equipment of most powerful floor models included a system of protection against overturning. But the thermostat and remote control is only in premium products. 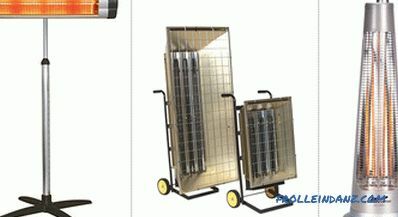 Varieties of floor-standing IR heaters. 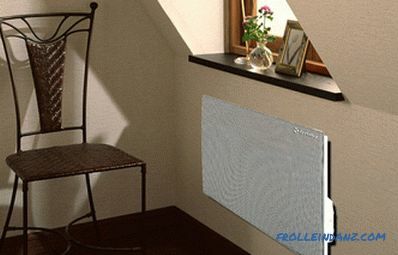 Wall-mounted infrared heaters, whose performance can be compared with radiators of centralized water heating, are installed in the same places. These devices are full-fledged heating devices. High power and radiation area implies considerable weight, but this indicator is not so important for devices of stationary use. System of protection against radiator overheating. 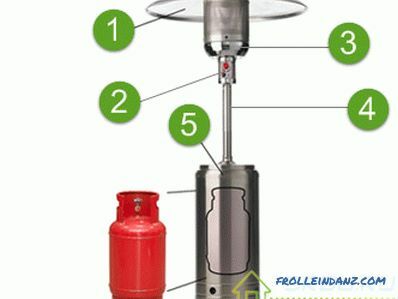 Manufacturers pay special attention to the appearance of such heaters. The surface of the panel can be decorated with both stylized drawings and quite decent author paintings caused by airbrushing. Some models are finished with natural stone or Tibetan salt. But such decorations, in addition to significantly increasing the cost of the heater, reduce its effectiveness, and the paint, when heated, can release harmful fumes. 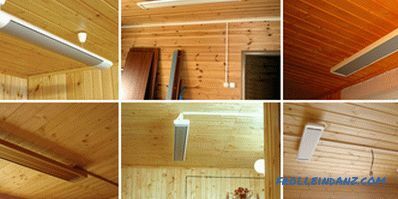 Ceiling heaters have a unitary, functional look that is difficult to fit into the refined interior. 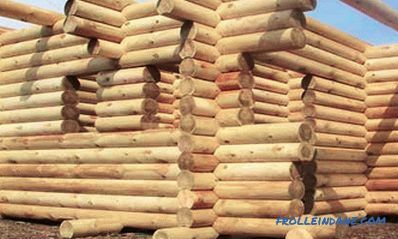 They are used mainly in retail and office premises, on open areas of street cafes. Given the specifics of use, many manufacturers are developing models with special fasteners that are compatible with mounting points and Armstrong ceiling standards. 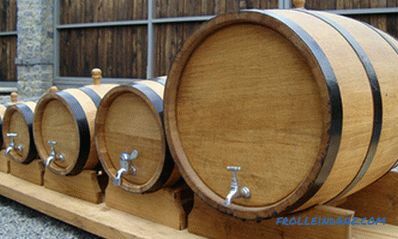 In everyday life are used in cottages, garages or workshops. A very promising area of ​​use is heating of greenhouses in early spring and late autumn, which can significantly extend the period of ripening and harvesting. Varieties of ceiling IR heaters. From the physics course, it is known that infrared radiation is in the range of 0.75–1000 µm. 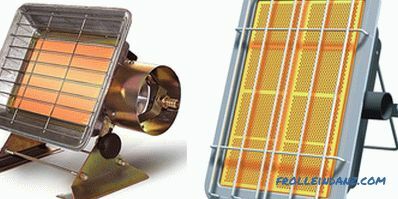 The manufacturers of IR heaters divided this range into three sectors. This is done because the operating temperature of the heating element depends on the wavelength. 1. At a temperature of the heating element from 100 to 600 0 C - the emitter operates in the long-wavelength range of 5.6 - 100 microns. Such devices are considered low-temperature. They are intended for residential premises where the ceiling height is limited to 3 m. As a rule, the power and temperature of such models is limited to 120 ºС. 2. 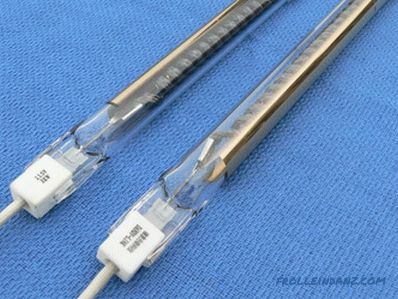 When the temperature of the heating element is from 600 - 1000 0 С - the average wave range is 1.5-5.6 microns. 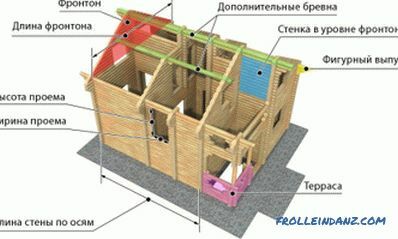 Devices with such performance indicators are used in high-ceiling premises of 3-6 m. Usually these are private houses of old construction or public buildings. 3. Heating temperature over 1000 ºС - heaters use a short-wave infrared wavelength range of 0.75-1.5 microns. 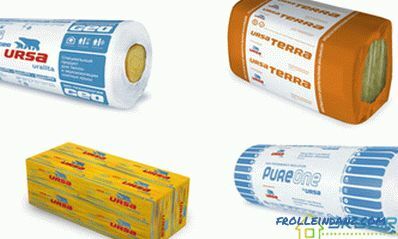 They are used for space heating with ceilings of 6-8 m: warehouses, hangars, assembly shops or for heating outside. Power 100-400 W . The devices of such power include heating devices of the so-called "soft heat", the maximum temperature of which reaches 60º. The heater can be used in humid conditions up to 100%. In addition, heaters of this type are recommended for use in preschool educational institutions so that children cannot get hurt. Power is 400-600 W , temperature is from 60 to 100 ºС. Intended, for the most part, for installation in offices. Some heaters have ceiling mounts Armstrong. Metal cases with different protection from IP55 to IP21. 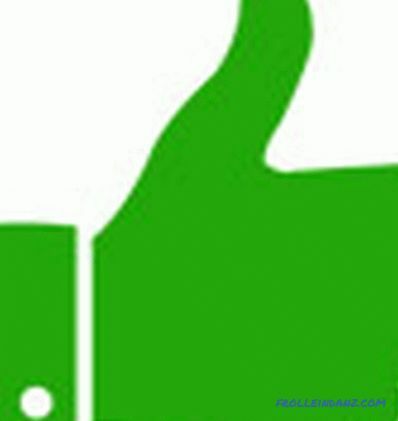 Power is 600-1000 W at a temperature of 101-280 ºС. 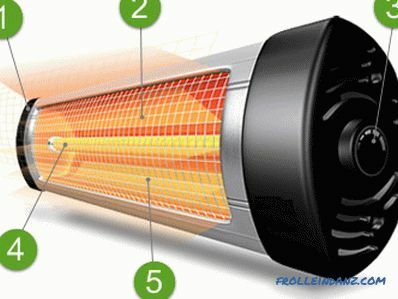 Infrared heaters, the technical characteristics of which are limited by this temperature are produced by many companies. The devices are designed to create warm curtains over windows or doorways. Power is more than 1000 W, surface temperature is more than 300 ºС. Mainly intended for external use for heating open terraces, winter gardens, balconies. 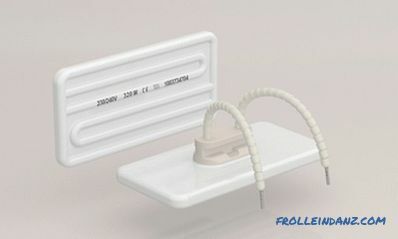 The ceramic panel is heated due to a metallic thread having high resistance. 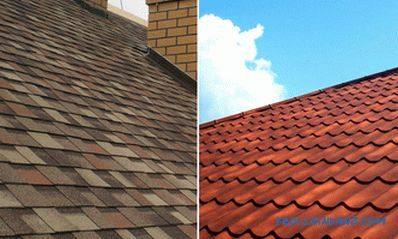 Due to the effect of magnetic induction, the filament tells the ceramic panel not only temperature, but also an impulse for emitting IR waves. Due to the design features, the bath type of generating IR waves can only be used in wall and ceiling models. IR waves are induced by a halogen lamp. The devices have compact dimensions and large capacity quickly heat the room, can be used on the street. 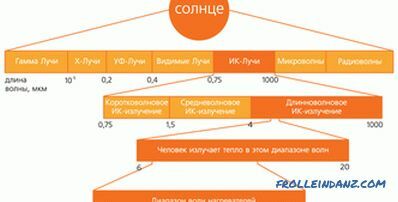 The most common models of manufacturers: Neoclima, Ballu, General Climate. A significant disadvantage of these devices is that during operation they glow quite brightly. Generates IR radiation in the spectrum that is invisible to the human eye. 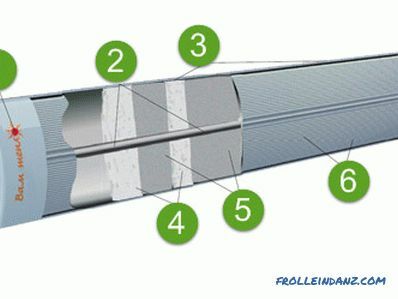 The most popular manufacturers: Electrolux, Frico, Adax, Hintek, Timberk, Simbo. Have a relatively low power consumption. Due to compact dimensions, several rods can be mounted in one generating panel, which significantly increases its efficiency. 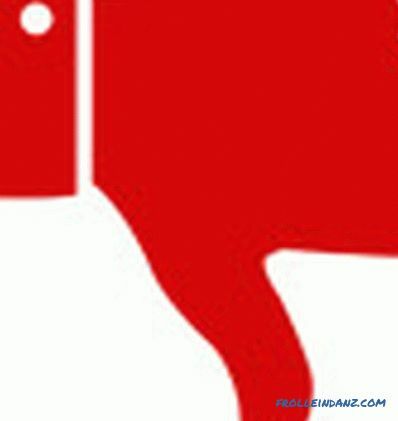 Among the shortcomings it should be noted the high cost of products based on carbon elements. This device has a dual principle of operation. The gas, burning, heats the radiating element, around which the reflector is located. Infrared waves, reflected from it, form a thermal dome or field, depending on the model and direction of reflection of the reflector. Devices of this type are completely autonomous from which you can use in hikes and in summer cottages where there is no electricity. Even compact models are very effective; they can be safely applied in case of emergency shutdown of heat supply in winter. Brand devices are equipped with all kinds of security systems that will shut off the gas supply if the fire disappears or the amount of carbon monoxide in the room exceeds the norm. In addition to the convenience of operation, they are equipped with a built-in piezo ignition. Fast and mild heating of all objects in the affected area. Unlike convection devices, it does not pick up dust. Possibility to adjust the heating zone. They do not dry the air and do not burn oxygen. This is true only for electric IR generators. It is better to refrain from using autonomous gas generators in a small room. Many models "specialize" in heating rooms with high ceilings. All devices This type is completely autonomous, even in one apartment it is still difficult to combine them into a single network. You have to recruit commands for each heater separately. Some models crackle when heated and cooled - this is due to the fact that metals with different degrees of expansion during heating and cooling (steel + aluminum) are used to manufacture the device.